Vacation rental cottage. Sleeps 2, 0 bedroom, 1 bathroom. No pets allowed. 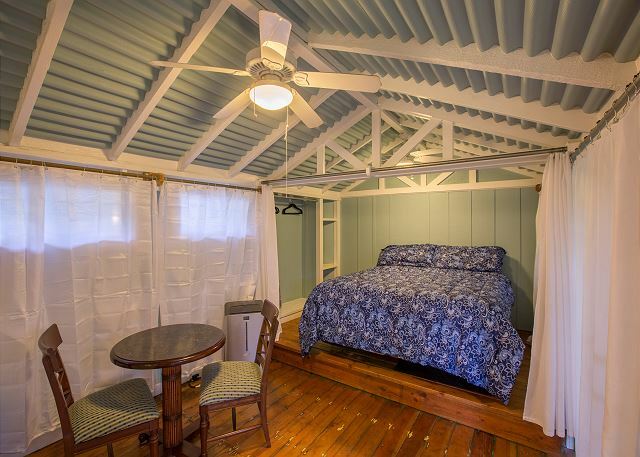 Small charming studio in Lanikai that's great for singles or a couple looking for an inexpensive place to stay. Of course you will want to go to the beach that's why your here. This home is located within walking distance (less than 2 minute walk) to world famous Lanikai Beach. Want to get something to eat or do some shopping? You can walk to well known Buzz's Steakhouse for lunch or dinner located right across Kailua Beach Park or head over to Kalapawai General Store for your morning coffee or fantastic deli sandwiches. To try more of our local flavor dining or great shopping you are just a short 2 minute drive to our delightful Kailua Town. This made for a fun/quiet stay in the small town near Lanikai Beach. The property was perfect for our 3 night stay, and the location was great for walking around and checking out the local sites. Would definitely recommend to anyone looking for a quick Hawaii getaway! very nice and clean. perfect location! property management was prompt to resolve one minor problem. I highly recommend renting this location! Very cozy little guest house in a fabulous location. Great responsiveness from the owner and caretaker. This cottage was just as advertised. Fabulous location near beaches and Kailua. Pleasant surprises: comfort of the bed and quality of sheets and towels. We were invited to park in the driveway although off-street parking is not listed as a benefit. I believe parking otherwise could be a concern. Our extended family gathered together to attend a wedding that was being held in a venue close by. While the rest of the family stayed in the main house, my wife and I enjoyed the privacy of the Ocean Studio. It was perfect. Close to everything and yet cosy and secluded. Great little beach house behind the main dwelling which looked out onto the water. 2 min walk to the beach with kayak hire and shopping a short drive away. Suitable for a romantic getaway for 2. I went to the beach every was comfortable to go to Lanikai Beach in a few minutes on foot.The management staff were very friendly and helpful.I wanted to use the next Hawaii trip again. This was my second time staying in the Ocean Studio, and it was just as enjoyable as the first. It's conveniently located less than a two minute walk to Lanikai Beach, stocked with some beach supplies (chairs, towels, toys), has AC, and has enough space for 1 or 2 people. Kepola is an awesome and very attentive house manager. The studio was very clean when I arrived. Even when guests are using the larger house, the studio is secluded enough that you don't feel intruded on or hear outside noise from the others. I would definitely recommend this studio and think that it's the best place to stay if you're in Lanikai/Kailua. We had the most amazing week staying at this cottage. It was perfect for our Anniversary trip. Kepola is just absolutely wonderful. We will be back. great place for the price. very hawaiian, very local. aloha! the studio was very hawaiian, near the beach and in a lovely neighborhood.We very much enjoyed our time here. we would come back again, the management team were very helpful and friendly. the only downside was no washer and dryer and parking was on the street, not the driveway. There was a clothes line to hang on and we draped our damp towels on the porch railings to dry. It wasn't the end of the world not having a washer or dryer, we made it work. mahalo to Kepola for her help when we had questions. Great place aar reasonable price! Wow! Just wow! The studio was a great way to spend a reasonable amount of money on one of the greatest beaches In the world. The folks that run the property are the most accommodating and will help you through issues that may arise, items you may need or generall recommendations of places to eat or activities to do. The accommodations were exactly as described and were great for a 5 day stint. We definitely enjoyed every walk on the beach and even enjoyed the pillbox hike, which was just a little over a block away from the studio. We ate at some fabulous restaurants during our stay and we will definitely be back. It was all that we could of asked for. We had a wonderful stay. Very beautiful beaches close by. The property mag agent was very helpful! Amazing location (2 minute walk to beach), 5 minute drive to town. Perfect size for 2 people! Kitchen was well equipped, and there were beach towels, chairs and an umbrella for us to use. Wifi worked perfectly and the AC unit kept us nice and cool at nighttime. Would highly recommend! Cute, right there on Lanikai Beach. We had a great stay in the Ocean Studio. It's a perfect beach crash pad, roll out of bed, walk 30 steps and you're on one of the best beaches in the world. I love this little place, perfect for a couple looking for more of the local scene or a single trying to be taken advantage of. Perfect for the business traveler. I have stayed here a few times and love it! Love the location away from the tourist traps and the drive over is beautiful. With all the conveniences the business traveler needs 5 minutes away it is a slice of paradise in a quite neighborhood! The management team is fantastic! This cottage was exactly what I had in mind when planning my get-away. Quaint and cozy. Great location. The added benefit was the front house was not rented so I was able to access the backyard which is right on the water. Magical to have morning coffee while watching the sunrise over the Mokuluas. This is a great place for the location and the price! The beach is less than 250 steps away and if you're lucky enough to have the main house be vacant during your stay in the guest house, you can have access to the water front all to yourself. Definite bonus! Would definitely book this place again! I love this place for a quiet business trip. It is far away from the craziness of Waikiki yet only 30 minutes from most meeting places. Well kept and the staff is fantastic! Clean and comfortable with all the conveniences close by. ( food, Starbucks etc). We loved our stay here! The view of the ocean from the backyard was priceless and the sun rises (also seen from the back yard) looked like screen savers. The crashing of the waves could be heard from the rental and was incredibly soothing. The room was clean, cozy, and the perfect size for us two. Management was friendly and warm, but also gave us our space when we wanted. Before the trip I was worried about parking as the rental is on Lanikai, a beautiful and popular beach, but parking was never an issue. I would recommend this place to anyone and will be booking here the next time I travel back! There were not guest staying in the main home at the time so we allowed this guest access to the oceanside yard which otherwise is not listed as an amenity or would be granted if guest were in the main home. We can guarantee this for every guest but if it's possible we will. Cute and cozy beachfront cottage, next to the best beaches! We loved this cute cottage! We want to build one just like it. Simple, clean and cute with a nice king bed.close to the best beaches and away from the Waikiki crowd. Nice drive time up north during bad weather, otherwise would have stayed in the neighborhood every day! Hostess was the friendliest and most helpful too! Awesome little studio, rental process was easy and everyone was incredibly helpful and friendly. So I didn't book through Aloha Beachfront Rentals, it was a third party (that went bankrupt before I arrived, they honored my booking which was a great relief). The property was not exactly as promised on the third party site, that being said Kepola did everything to make my stay as enjoyable as possible. I came for my best friends wedding, and it helped that she did as much as she could to make the stay great. I arrived on a Sunday night and no one was at the property to meet me as my email said, it took an hour to locate someone to let me in, my advise is book direct then you won't have the same problems I did. Just a word to those who are looking at booking this unit, if someone is staying in the main house on this property you won't be able to use the back yard of the property. I was lucky that no one was there when I was. That's the only reason I cannot give 5 stars across the board. However you are less than 2 minutes from the beach on foot. So if your looking for a place near the water without the hustle and bustle of Waikiki then this is the place for you. We are glad the reservation worked out for our guest. The property does not disclose the beachside of the home as an amenity for the guest in this unit to use. We do however let them use the beachside of the home if the main house is vacant. We also did extend the availability to use the driveway as parking to the guest as the main house was not occupied. We happily returned to this tidy, clean and well equipped studio! We love it here! Again, the management team was wonderful with their care and warm hospitality for us! It truly feels like home when we stay here! Mahalo Aloha Beachfront Rentals! Every detail was perfect, from our booking almost a year ago to our departure. We will definitely book here for our next visit. Absolutely perfect cottage for two!! We absolutely loved our stay! Very cute, clean, quiet studio apartment with porch. Very comfortable bed and efficient kitchen with everything you need! Walking out to the ocean with our coffee was priceless! Highly recommended!! Excellent experience. The Ocean Studio was exactly as described and photos were accurate. Lots of room and well decorated. Simple cute and clean! Very friendly manager. Thank you for a lovely stay! Everything was great. The first night we saw a HUGE roach in our kitchen, about the size of my hand! After that, no critters were around. It was the perfect size with perfect location. The shower mat also smelled really moldy and my feet didn't feel too clean after. Overall, had a wonderful time-- can't beat it! What a great place to stay. We were welcomed very warmly by Kepola, and she explained everything we needed to know about our property, the area, local places to eat etc. The property was perfect, and the location literally a few minutes walk from Lanikai beach. All the facilities you could want in the room. Very comfortable beds, and air-conditioning supplied. "Cute and cozy" perfectly describes this rental! It was also clean. 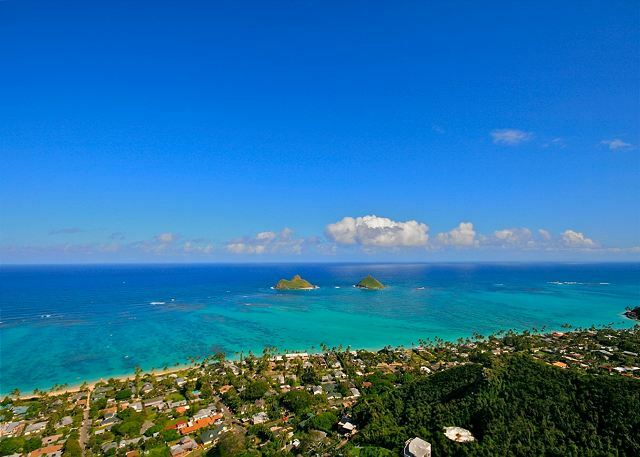 It is in the ideal location in Lanikai, steps away from the beach. The customer service and management were excellent and full of warmth and hospitality. We were so happy being here!!! We would definitely stay here again! Simple Lanikai retreat . . . If you need a small place by the beach in Lanikai on the ocean with easy access in and out then look here. We loved our time here in Lanikai. The accommodation was all we needed & wanted to make our own one day. The access to beautiful views were a few steps away. The beach was such a close walk - we went everyday. Close proximity to the Pillbox Hiking Trail also. Really had such great time. As last year I enjoyed this sweet studio again and found it in the same clean and sweet decorated state again. Nothing has changed, as if just had left. So I felt home again immediately. It#s 7 houses from the beach access that leads to Lanikai beach. If you want to walk to Kailua Beach it's just 300-400m into the other direction along the street. Kepola who is responsible for the guests is a wonderful open hearted and helpful person, so are the gardeners that do some maintenance from time to time around the house to keep this place so beautiful. My work sends me to Honolulu from time to time. I have stayed over in Waikiki enough to sort of be tired of all the people and commotion of the city. This time I looked toward my favorite beach in Oahu for a small rental property. I found this little studio apartment splitting Kailua and Lanikai. I should say just right up front that this location rocked. It was exactly what I was looking for. Although the beach wasn’t accessible from the back yard, it was not even a 2 minute walk to the sand. The evenings were so peaceful! I could wake in the morning and within just a few minutes be sitting under the shade of a tree watching the ocean. The atmosphere around this place was so low key. If I had to work, this was the place to stay while doing it. It was really an all-expense paid vacation. The apartment itself was absolutely perfect for my needs. It was clean and comfortable. The kitchenette had plenty of supplies for the week. The only “knock” I guess would be the lack of air conditioning. I knew up front and was for warned by the manager that it could be uncomfortable. I was offered other options ahead of time. For me with my afternoon work schedule, the lack of A/C wasn’t bad. If my wife would have joined me on this trip it could have been a problem. By the time I got back in the late evenings after work it was plenty comfortable. That said a word to the wise, listen to the manager about the area ahead of time. She will be honest with you. The manager was extremely friendly and helpful. There were only a few issues during the stay that with just a short text was fixed within 15 minutes at most. It was nice having a person to deal with rather than a front desk. Next time I return to this island, I will definitely look toward Aloha Beachfront Rentals again. If alone or with just my wife, this studio apartment will be first on my list. If I bring the family I’m sure they can accommodate whatever my needs are. Convenient location that is clean and steps out to a beach!! I stayed here with my bf for 8 days and the place was very convenient since it was literally 2 mins walk out to Lanikai Beach! We rented a vehicle to drive out to see the island daily and the location was convenient since parking was included. It was close to the town of Kailua, so we were easily able to buy local food and groceries from a Whole Foods market to save ourselves some money. The backyard was awesome, and since no one stayed in the main house, Kepola gave us permission to access the backyard and we made ourselves breakfast about every morning and sat outside to eat and watch the sunrise. It was totally relaxing, and even though there was no air conditioning (it was my only concern), we found that the box fan and ceiling fans were cooling enough for sleeping. The room was equipped with all necessities and we didn't have to bring our own stuff for cooking and cleaning. For our stay, we met up with Kepola upon arrival and our day of departure. Overall, the vacation home was a lovely stay, convenient and relaxing. Me and my bf drive out daily to explore the island, and coming home to this location was what we needed each night. It is no 5 star resort or Hilton, but it was just a convenient place to stay with all that is needed. It is clean, safe, and location was excellent. I highly recommend this vacation room if you are a young couple like us and all that is needed is a convenient and basic place to stay in. I thoroughly enjoyed the stay and we are likely to keep in contact with Kepola for a future stay in Oahu. Mahalo!! We had the most wonderful time on our trip. My roommate and I were very happy with the Oceanside studio, and felt it was great for two people. The studio is in a great location. It is a short 2 minute walk to beach access, but you still have an ocean view from the sea wall. The studio is also very close to Kailuatown and Kailua Beach. The kitchenette and bathroom had everything we needed. We felt it was very well maintained and clean. We used the ceiling fans and a box fan so there was little issue with us being hot. We would definitely stay here again on our return trip. Lanikai Beach is absolutely beautiful and Kailua is a great place to stay. We fell in love with the place and hated to leave. I cannot imagine staying anywhere else on the island. The town is laid back, the beaches are beautiful, the food is great, and the people were so pleasant. Most importantly, the staff at Aloha Beachfront rentals were absolutely wonderful. They were great about giving advice regarding what to pack and places to go when you arrived. Let me just say that Kepola is one of the kindest people I have met! We ran into a sticky travel situation during our trip. Kepola and other staff members went above and beyond to help us out. The people we met were just incredibly sweet and we would not hesitate to rent from the again. The Ocean Studio is very comfortable and immensely enjoyable.. We rented the studio in addition to the Ocean House. With two ceiling fans, its own full bathroom, a kitchenette, a dining table and its own television, it was a perfect getaway for naps, relaxing, etc. It was also spotlessly clean. The two single beds made it more ideal for two separate adults then for a couple. The location on the beach and yet near things to do in Lani Kai and Kailua was perfect. The rental management staff were helpful, accommodating and a pleasure to work with from start to finish. I have stayed there 2 times and found that even though there isn't a designated parking place parking hasn't been a problem, Kopeka was an awesome and concerned hostess. I stayed at the Ocean Studio while on Oahu visiting friends. As a former Kailua resident, I already knew that this location would be perfect for what I was looking for, and it did not disappoint. The studio has a cute cottage feel and was the perfect size for what I needed, plenty of space to relax, eat meals, sleep without feeling too crowded. There is no A/C but the ceiling fan and windows open let in a nice breeze and I didn't get too hot. These are not luxury accommodations in terms of amenities (bring your own toiletries etc) but it was exactly what I was looking for and the location was as good as it gets. I stayed alone but the cottage would also be perfect for 2 people (although a couple may not find the twin beds ideal). There was no one staying in the main house so I had the front yard (a small grassy area right on the sea wall) to myself which meant I could enjoy some quiet time on a chair gazing at the ocean and the Mokes (islands) just off the shore. Although the house is ocean front there is a sea wall over reef, so there is no beach directly in front. However it's a very quick walk down the street to the beach access. If you have kayaks you can launch them right from the side of the property. The prop manager and caretakers were very friendly and easy to work with, and I feel like it's a very fair price for a beachfront property. It's also on the side of Lanikai closer to Kailua town, so I could easily bike into town for anything I needed. I didn't have any noise disturbances and slept soundly, but again I'm not sure what it would be like to have other guests staying in the main house. Overall I really loved staying at Ocean Studio and would highly recommend it if you're looking for a slightly rustic but ideally located alternative to a B&B in the area. My wife and I really enjoyed the ocean studio. Only steps from lanikai beach, and nestled into a very quiet road. We would definitely stay here again. What a dream for a vacation. I will never forget this place and all the friendly people and places to vista. I'd love to come back again. It's a long way from Italy but will come again. The second time staying here. Has everything you need for a relaxing stay. If you're looking for something fancy, try another place but if you want something casual, clean & comfortable, this is a great location. The management does everything possible to make sure you enjoy your time here. Excellent stay. I appreciate the attention received from Kepola,insuring all details of trip went smoothly. This cottage was perfect for us. It is right off Lanikai beach. There is a pathway down to the beach right next to the house. The area is very nice and the beach is BEAUTIFUL. We went all over the island and it was by far our favorite spot. It has a small town feel without feeling very touristy. There are grocery stores and some amazing restuarants very close by. We would definitely stay here again if we make it back to Oahu. Can't get over the view! Where to begin? The property management company stayed in contact with us throughout our stay to see if there was anything we needed. They were awesome. When we arrived at the studio we were THRILLED to see that the beach access is less than a two minute walk from the door of our studio. We started and ended our day hanging out at the beach, where we quickly made friends with several locals and other tourists. It is also very easy to walk to Kailua Beach, just around the corner. We are returning to this exact location next year and will be using Aloha Beachfront Rentals once again. LOVE! This is a great spot for casual times. It has the feeling of an old family beach house. The interior worked well for our group of 20. The kitchen was very functional for the large numbers. The best part was that the furnishings were comfortable and laid back - no pretense here. The contact person was very attentive to our needs. We were recommended this property by a friend and oh so happy of the choice! We used to live in Kailua so staying in town(Waikiki) is not an option when we visit. I dont think you could even get a hotel for that price, unbeatable! The property was immaculate and as there was no one staying in the main house, we were able to use the waterfront property to lounge and enjoy the amazing view of Kailua bay. The property managers were awesome as well. We will definitely use them again for our next stay.